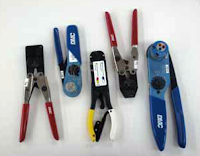 Before wire can be assembled to connectors, terminals, splices, etc., the insulation must be stripped from connecting ends to expose the bare conductor. Copper wire can be stripped in a number of ways depending on the size and insulation. When using any type of wire stripper, hold the wire so that it is perpendicular to cutting blades. Adjust automatic stripping tools carefully; follow the manufacturer’s instructions to avoid nicking, cutting, or otherwise damaging strands. This is especially important for aluminum wires and for copper wires smaller than No. 10. Examine stripped wires for damage. Cut off and restrip (if length is sufficient), or reject and replace any wires having more than the allowable number of nicked or broken strands listed in the manufacturer’s instructions. Make sure insulation is clean-cut with no frayed or ragged edges. Trim, if necessary. Make sure all insulation is removed from stripped area. Some types of wire are supplied with a transparent layer of insulation between the conductor and the primary insulation. If this is present, remove it. When using hand-plier strippers to remove lengths of insulation longer than 3⁄4 inch, it is easier to accomplish in two or more operations. Retwist copper strands by hand or with pliers, if necessary, to restore natural lay and tightness of strands. A pair of handheld wire strippers is shown in Figure 1. This tool is commonly used to strip most types of wire. The following general procedures describe the steps for stripping wire with a hand stripper. Insert wire into exact center of correct cutting slot for wire size to be stripped. Each slot is marked with wire size. Close handles together as far as they will go. Release handles, allowing wire holder to return to the open position. Terminals are attached to the ends of electrical wires to facilitate connection of the wires to terminal strips or items of equipment. [Figure 2] The tensile strength of the wire-to-terminal joint should be at least equivalent to the tensile strength of the wire itself, and its resistance negligible relative to the normal resistance of the wire. The following should be considered in the selection of wire terminals: current rating, wire size (gauge) and insulation diameter, conductor material compatibility, stud size, insulation material compatibility, application environment, and solder versus solderless. Preinsulated crimp-type ring-tongue terminals are preferred. 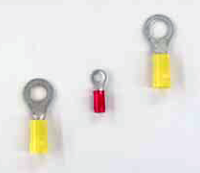 The strength, size, and supporting means of studs and binding posts, as well as the wire size, may be considered when determining the number of terminals to be attached to any one post. In high-temperature applications, the terminal temperature rating must be greater than the ambient temperature plus current related temperature rise. Use of nickel-plated terminals and of uninsulated terminals with high-temperature insulating sleeves should be considered. Terminal blocks should be provided with adequate electrical clearance or insulation strips between mounting hardware and conductive parts. Wires are usually joined at terminal strips. [Figure 3] A terminal strip fitted with barriers may be used to prevent the terminals on adjacent studs from contacting each other. Studs should be anchored against rotation. When more than four terminals are to be connected together, a small metal bus should be mounted across two or more adjacent studs. In all cases, the current should be carried by the terminal contact surfaces and not by the stud itself. Defective studs should be replaced with studs of the same size and material since terminal strip studs of the smaller sizes may shear due to overtightening the nut. The replacement stud should be securely mounted in the terminal strip and the terminal securing nut should be tight. Terminal strips should be mounted in such a manner that loose metallic objects cannot fall across the terminals or studs. It is good practice to provide at least one spare stud for future circuit expansion or in case a stud is broken. 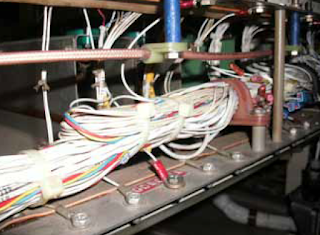 Terminal strips that provide connection of radio and electronic systems to the aircraft electrical system should be inspected for loose connections, metallic objects that may have fallen across the terminal strip, dirt and grease accumulation, etc. These conditions can cause arcing, which may result in a fire or system failures. Wire terminal lugs should be used to connect wiring to terminal block studs or equipment terminal studs. No more than four terminal lugs, or three terminal lugs and a bus bar, should be connected to any one stud. The total number of terminal lugs per stud includes a common bus bar joining adjacent studs. Four terminal lugs plus a common bus bar are not permitted on one stud. Terminal lugs should be selected with a stud hole diameter that matches the diameter of the stud. However, when the terminal lugs attached to a stud vary in diameter, the greatest diameter should be placed on the bottom and the smallest diameter on top. Tightening terminal connections should not deform the terminal lugs or the studs. Terminal lugs should be positioned so that bending of the terminal lug is not required to remove the fastening screw or nut, and movement of the terminal lugs tends to tighten the connection. The aluminum terminal lugs should be crimped to aluminum wire only. The tongue of the aluminum terminal lugs, or the total number of tongues of aluminum terminal lugs when stacked, should be sandwiched between two flat washers when terminated on terminal studs. Spacers or washers should not be used between the tongues of terminal lugs. Special attention should be given to aluminum wire and cable installations to guard against conditions that would result in excessive voltage drop and high resistance at junctions that may ultimately lead to failure of the junction. Examples of such conditions are improper installation of terminals and washers, improper torsion (torquing of nuts), and inadequate terminal contact areas. Broken wires can be repaired by means of crimped splices, by using terminal lugs from which the tongue has been cut off, or by soldering together and potting broken strands. These repairs are applicable to copper wire. Damaged aluminum wire must not be temporarily spliced. These repairs are for temporary emergency use only and should be replaced as soon as possible with permanent repairs. Since some manufacturers prohibit splicing, the applicable manufacturer’s instructions should always be consulted. Junction boxes are used for collecting, organizing, and distributing circuits to the appropriate harnesses that are attached to the equipment. 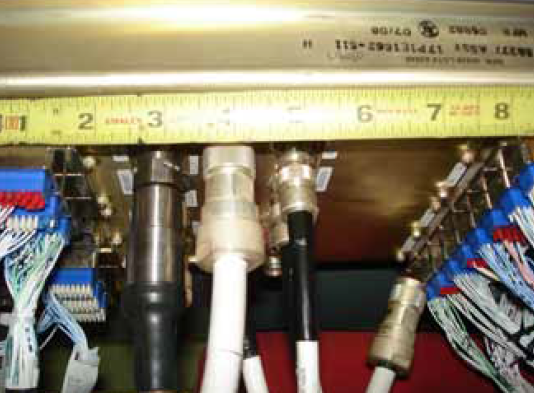 [Figure 7] Junction boxes are also used to conveniently house miscellaneous components, such as relays and diodes. Junction boxes that are used in high-temperature areas should be made of stainless steel. Replacement junction boxes should be fabricated using the same material as the original or from a fire-resistant, nonabsorbent material, such as aluminum, or an acceptable plastic material. Where fireproofing is necessary, a stainless steel junction box is recommended. Rigid construction prevents oil-canning of the box sides that could result in internal short circuits. In all cases, drain holes should be provided in the lowest portion of the box. Cases of electrical power equipment must be insulated from metallic structure to avoid ground fault related fires. The junction box arrangement should permit easy access to any installed items of equipment, terminals, and wires. Where marginal clearances are unavoidable, an insulating material should be inserted between current carrying parts and any grounded surface. It is not good practice to mount equipment on the covers or doors of junction boxes, since inspection for internal clearance is impossible when the door or cover is in the closed position. Junction boxes should be securely mounted to the aircraft structure in such a manner that the contents are readily accessible for inspection. When possible, the open side should face downward or at an angle so that loose metallic objects, such as washers or nuts, tend to fall out of the junction box rather than wedge between terminals. Junction box layouts should take into consideration the necessity for adequate wiring space and possible future additions. Electrical wire bundles should be laced or clamped inside the box so that cables do not touch other components, prevent ready access, or obscure markings or labels. Cables at entrance openings should be protected against chafing by using grommets or other suitable means. Connectors (plugs and receptacles) facilitate maintenance when frequent disconnection is required. There is a multitude of types of connectors. The connector types that use crimped contacts are generally used on aircraft. Some of the more common types are the round cannon type, the rectangular, and the module blocks. 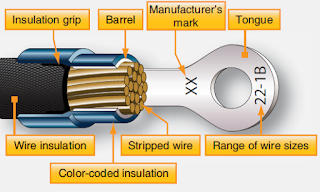 Environmentally resistant connectors should be used in applications subject to fluids, vibration, heat, mechanical shock, and/or corrosive elements. When HIRF/lightning protection is required, special attention should be given to the terminations of individual or overall shields. The number and complexity of wiring systems have resulted in an increased use of electrical connectors. 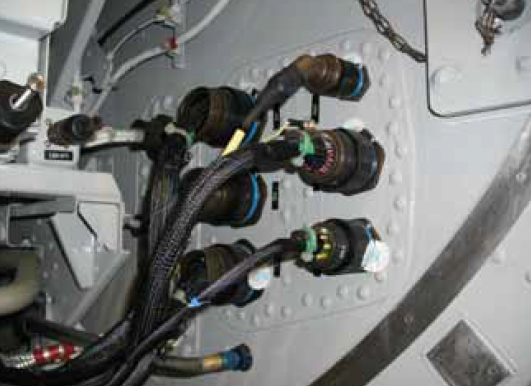 [Figure 8] The proper choice and application of connectors is a significant part of the aircraft wiring system. 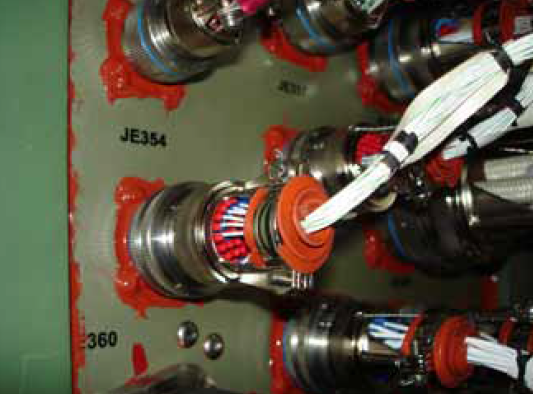 Connectors must be kept to a minimum, selected, and installed to provide the maximum degree of safety and reliability to the aircraft. For the installation of any particular connector assembly, the specification of the manufacturer or the appropriate governing agency must be followed. Connectors must be identified by an original identification number derived from MIL Specification (MS) or OEM specification. 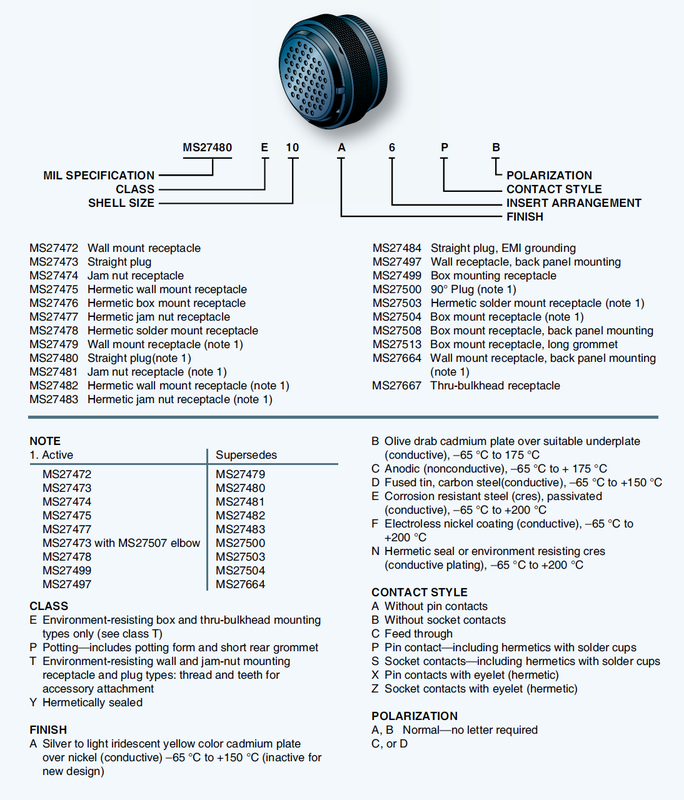 Figure 9 provides information about MS style connectors. 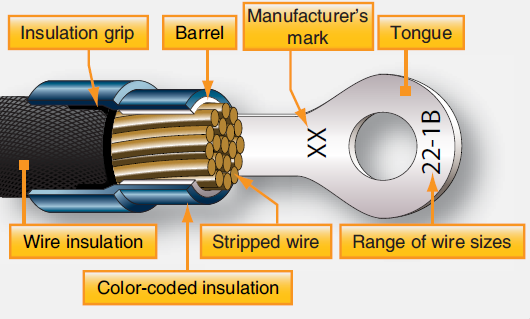 Environment-resistant connectors are used in applications where they are probably subjected to fluids, vibration, heat, mechanical shock, corrosive elements, etc. 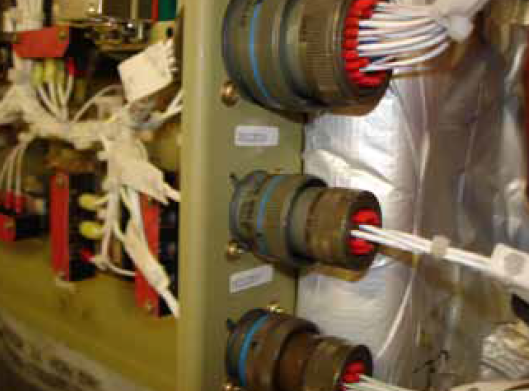 Firewall class connectors incorporating these same features should, in addition, be able to prevent the penetration of the fire through the aircraft firewall connector opening and continue to function without failure for a specified period of time when exposed to fire. Hermetic connectors provide a pressure seal for maintaining pressurized areas. When EMI/RFI protection is required, special attention should be given to the termination of individual and overall shields. Backshell adapters designed for shield termination, connectors with conductive finishes, and EMI grounding fingers are available for this purpose. Rectangular connectors are typically used in applications where a very large number of circuits are accommodated in a single mated pair. [Figure 10] They are available with a great variety of contacts, which can include a mix of standard, coaxial, and large power types. Coupling is accomplished by various means. Smaller types are secured with screws which hold their flanges together. Larger ones have integral guide pins that ensure correct alignment, or jackscrews that both align and lock the connectors. Rack and panel connectors use integral or rack-mounted pins for alignment and box mounting hardware for couplings. Module blocks are types of junctions that accept crimped contacts similar to those on connectors. Some use internal busing to provide a variety of circuit arrangements. They are useful where a number of wires are connected for power or signal distribution. 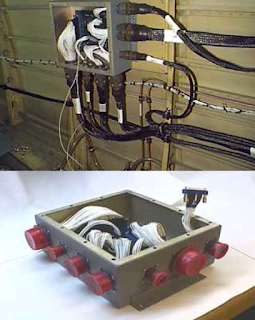 When used as grounding modules, they save and reduce hardware installation on the aircraft. 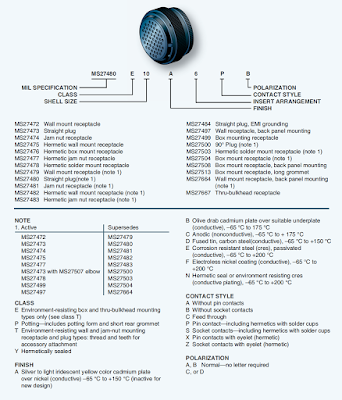 Standardized modules are available with wire end grommet seals for environmental applications and are track mounted. Function module blocks are used to provide an easily wired package for environment-resistant mounting of small resistors, diodes, filters, and suppression networks. In-line terminal junctions are sometimes used in lieu of a connector when only a few wires are terminated and when the ability to disconnect the wires is desired. The in-line terminal junction is environment resistant. The terminal junction splice is small and may be tied to the surface of a wire bundle when approved by the OEM. Selected connectors must be rated for continuous operation under the maximum combination of ambient temperature and circuit current load. Hermetic connectors and connectors used in circuit applications involving high-inrush currents should be derated. It is good engineering practice to conduct preliminary testing in any situation where the connector is to operate with most or all of its contacts at maximum rated current load. When wiring is operating with a high conductor temperature near its rated temperature, connector contact sizes should be suitably rated for the circuit load. This may require an increase in wire size. Voltage derating is required when connectors are used at high altitude in nonpressurized areas. To accommodate future wiring additions, spare contacts are normally provided. Locating the unwired contacts along the outer part of the connector facilitates future access. A good practice is to provide two spares on connectors with 25 or fewer contacts; 4 spares on connectors with 26 to 100 contacts; and 6 spares on connectors with more than 100 contacts. Spare contacts are not normally provided on receptacles of components that are unlikely to have added wiring. Connectors must have all available contact cavities filled with wired or unwired contacts. Unwired contacts should be provided with a plastic grommet sealing plug. Wires that perform the same function in redundant systems must be routed through separate connectors. On systems critical to flight safety, system operation wiring should be routed through separate connectors from the wiring used for system failure warning. 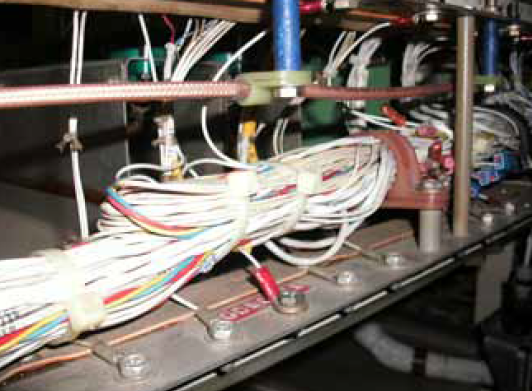 It is also good practice to route a system’s indication wiring in separate connectors from its failure warning circuits to the extent practicable. These steps can reduce an aircraft’s susceptibility to incidents that might result from connector failures. 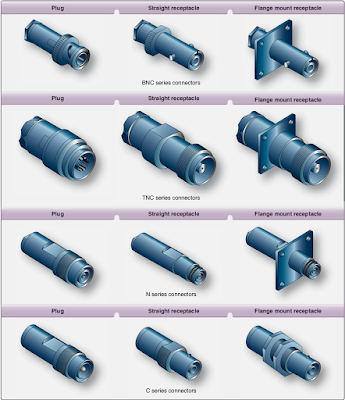 Connectors must be of a type that excludes moisture entry through the use of peripheral and interfacial seal that are compressed when the connector is mated. Moisture entry through the rear of the connector must be avoided by correctly matching the wire’s outside diameter with the connector’s rear grommet sealing range. It is recommended that no more than one wire be terminated in any crimp style contact. The use of heat-shrinkable tubing to build up the wire diameter, or the application of potting to the wire entry area as additional means of providing a rear compatibility with the rear grommet is recommended. These extra means have inherent penalties and should be considered only where other means cannot be used. Unwired spare contacts should have a correctly sized plastic plug installed. Connectors must be installed in a manner that ensures moisture and fluids drain out of and not into the connector when unmated. Wiring must be routed so that moisture accumulated on the bundle drains away from connectors. 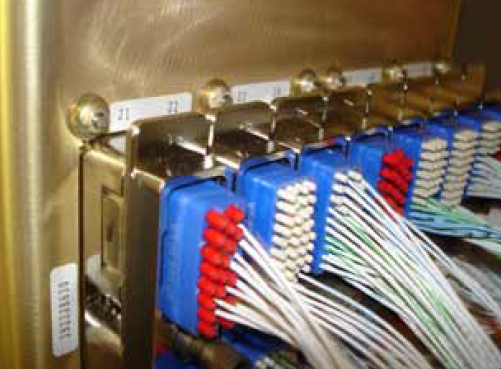 When connectors must be mounted in a vertical position, as through a shelf or floor, the connectors must be potted or environmentally sealed. In this situation, it is better to have the receptacle faced downward so that it is less susceptible to collecting moisture when unmated. Sufficient wire length must be provided at connectors to ensure a proper drip loop and that there is no strain on termination after a complete replacement of the connector and its contacts. Never drop anything on coaxial cable. Never step on coaxial cable. Never bend coaxial cable sharply. Never loop coaxial cable tighter than the allowable bend radius. Never pull on coaxial cable except in a straight line. Never use coaxial cable for a handle, lean on it, or hang things on it (or any other wire).